Platforming is a fantastic genre, but most would call it pretty straightforward. You jump on the platforms and traverse the level. When mixed up into puzzle-platforming, things become considerably more complicated. 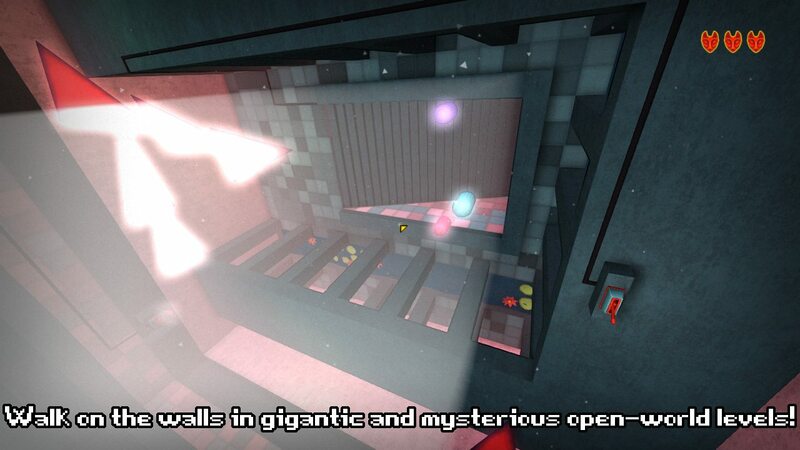 Well, sort of… You jump on the platforms and complete the puzzles to traverse the level. A lot of the puzzles in TRI are extremely clever, and leave me bonking myself on the forehead when I finally discover the answer. Other puzzles leave me so befuddled that I’m forced to step away from my computer, lest I hurl the mouse through my monitor. Most puzzle platformers rely on a unique mechanic, such as a gun that creates portals *nudge*. TRI offers it’s own unique mechanics, and an open-level layout style that will keep you wondering where to go next. This has advantages and disadvantages, but overall the feeling of freedom surely adds to the exploration. The sounds are wonderful, and the music fits in with unknown insanity that lies inside every room of this mad temple. It seems to have all the right stuff, but will it be enough to stand the test of time? Lets find out, as we take a deeper look at TRI. 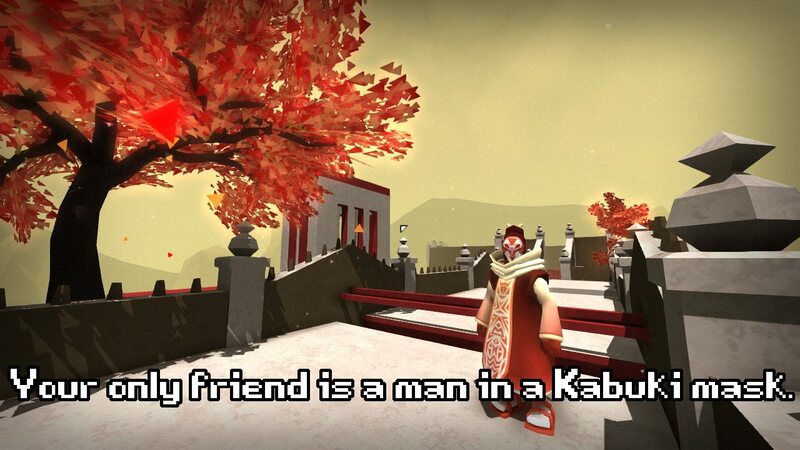 After a short cutscene, you will be greeted by the Kabuki-man. After some exposition about trying to reunite a pair of eternal fox-gods, he will lead you through a short tutorial detailing the controls. Shouldn’t be too hard since they are all laid out in the standard FPS fashion. During a trip down one of the halls, a trapdoor opens up and you are locked inside the temple. Surprise is how you enter, and will be a recurring theme all the way until the exit. 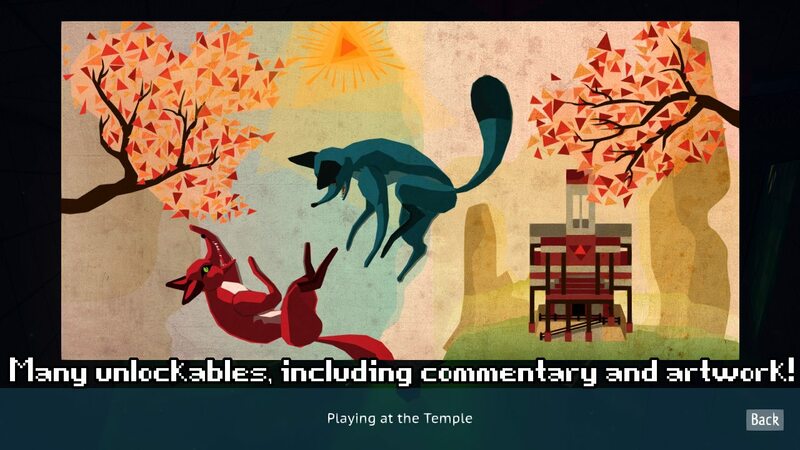 In order to progress to the next “dimension” (level) you must collect three fox statues and place them on three pedestals. After a bit of platforming, you will find powers to assist you in your journey. You start by creating triangles which can be used as platforms. Eventually you are able to use the triangles as a path to walk up any wall you choose! When combined with the wide-open style of the levels, the options for which way to go next are almost always limitless. Even if you end up spending 5 minutes climbing the wrong wall, your patience will be rewarded as you might find a cat statue. Collect enough of these and you will start to unlock bonus content. Everything from concept art to level-commentary as you play. Replayability anyone? This game has a multitude of options available, from resolution to field of view. There is also a global high-score table, just in case finding the 12 hidden statues in whichever level wasn’t quite enough to satiate your urge for replayability. Heck, you can even customize the color of the triangles. Initially the ones you can walk on are yellow, while the ones that are too steep to climb have a red tint. I changed the yellow to green, because green means go. It might not seem like a mind-blowing addition, but tiny things tend to add up in a big way. Small things like cherry blossoms falling around your feet from the gigantic polygon trees that some developer so lovingly planted. You can truly feel the amount of care that went into this game, from the gameplay right down to the dialogue. While the tone was mostly serious, some silliness does seem to shine through that creepy Kabuki-man. Or maybe my sense of humor is just really twisted. There is very little to criticize about TRI: Of Friendship and Madness. I don’t enjoy that the music will be absolutely blisteringly crazy at one minute, and complete silence at the next. Sometimes platforms will fling you off the ledge you are attempting to land on when the gravity shifts back to normal. Lining up the platforms takes some finesse, especially when walking up walls, and a misplaced one can easily mean a trip back to the very start. A couple of the puzzles really are just cruel, and lent themselves to the “madness” part of the title. TRI doesn’t have controller support. The voice acting also leaves something to be desired. Overall though, the puzzles were hugely satisfying to complete. Wandering the temple and trying not to get disoriented when gravity is flipped is pure joy, mixed with the tiniest bit of vertigo. So far I’ve only been able to enjoy the commentary for the first level, but replaying it with thoughts from the dev gives things a whole new life (especially as a reviewer) during a 2nd playthrough. It’s very likely I’ll be back to this game in search of more unlockable bonus content, or maybe just to climb around on the ceiling some more. Fantastic work Rat King Entertainment and Rising Star Games, I hope to see much more like this in the very near future. Summary: Puzzle platforming at some of it’s finest. Create platforms and climb walls! Definitely not for squares. Final Score: 8/10 for aesthetic, replayability, innovation, and gameplay. TRI: Of Friendship and Madness was released on Steam Oct 9th, 2014. Also, there’s a sale on GamesRocket during the weekend where you can get it for 33% off! You can also join my gaming adventures via Lets Play. Hope to see you there!